Lily Lane died at the lake, but it’s not where she’s bound to stay. To move on, she must solve her own murder and save others from a similar fate. Will Lily be able to protect others from sharing in her end fate, or will others fall victim to the crimes at Lakeview Shores? Cynthia Kumanchik, has joined me today to delve into the crimes of this small community and uncover some of the secrets of ‘Lake Girl’. Cynthia, can you start our investigation today by sharing the initial inspiration behind the mysteries of the lake with us? It started from a lake, where I lived and a restaurant I frequented. We lived on that lake for over 10 years, watching it change and grow, but never getting tired of it. Did you find that there were other experiences from your life, aside from your observances of lake life helped influence the direction of ‘Lake Girl’? A believer in spirits and the paranormal, I wondered what it would be like to have the main character as a ghost. It wasn’t hard to imagine Lakeview Shores because we lived in a similar small town, sometimes driving our boat to the local lake hangout where our daughter worked as a waitress. With such a strong connection to the dynamics of lake life, how did you find the characters developed? The characters are based loosely on people who frequented the restaurant and lived in that lake town of two thousand residents. As the characters and the storyline developed together, what did you feel was the most important message that resulted from this combination of people and plot? Like Alice Sebold’s Lovely Bones whose main character is a teenage ghost and Sarah Dessen’s Along for the Ride that deals with mother-daughter relationships, Lake Girl centers on a teenage ghost who works with her mother to find her killer. I wanted to stress the importance of mother-daughter relationships and how special they are. Did you feel that you learnt anything special from bringing this unique bond to life in your novel? Learning to write from a YA perspective and how the character grows and changes even in her ghostly state. What did you try to keep in the forefront of your mind to keep yourself in the YA frame of mind? Strong characters who have life-changing experiences. Do you find that working with such strong characters energizes your writing, or do the demands of tackling a project the size of a novel overwhelm your work to the point where you find that you get exhausted writing? Writing allows me to explore other worlds and reflect on characters’ conflicts. It can be both rewarding and exhausting. What has allowed your author voice to progress as you’ve continued writing beyond any exhaustion? I’ve learned many techniques through writers’ conferences and my writers’ group. What have these techniques contributed to the creation of your author brand? I like to write YA & women’s fiction and focus on the paranormal or sci-fi genres. Writing about the future fascinates me–creating new worlds and conflicts. Well, I don’t want to keep you from these worlds of fascination much longer, but before you go, can you share a little taste of the next adventure that readers can expect from your pen in the future? I’m working on a YA sci-fi novel set in 2050 where robots live and co-exist among humans. I’m curious to find out what your take on this not too distant future is, but I guess I’ll have to wait with the readers to find out, but in the meantime, we can all settle our minds with ‘Lake Girl’. Excited to read the book we discussed today? Find it here on Amazon: ‘Lake Girl ( ASIN: B07B8WRB96 )‘. 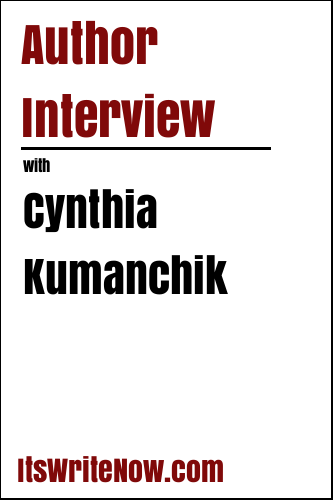 Want to find out more about Cynthia Kumanchik? Connect here!